Vitamin C or ascorbic acid is a water-soluble nutrient. Vitamin C in the body, acts as an antioxidant, which helps protect the cells from any damage by free-radicals. There are several benefits of vitamin C for skin including curing damaged skin, reducing and preventing wrinkles, whitening and easing acne and acne scars. It is important to regularly eat vitamin C rich foods or supplements. Besides, topical use of commercial products which contain vitamin C can also be helpful. 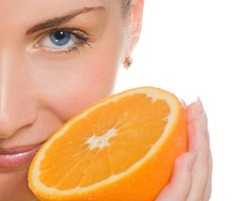 Vitamin C is especially beneficial for healthy, glowing, young-looking skin. It has been used for many years in various home remedies to help alleviate skin problems. Provided below are some of the ways in which vitamin C benefits the skin. Various factors contribute to damaging skin,including extreme dry weather, cold weather, or exposure to sunlight. Dry skin causes itching which can result in scarring. The best method of reducing dryness in the skin is by ensuring a diet high in vitamin C. 60 mg of vitamin C, through meals, helps ease the dryness and restores lost moisture. Vitamin C also helps build collagen and prevents sagging skin that occurs when the skin loses elasticity. This helps prevent wrinkling and drying of the skin, which occurs with aging. Pigmentation is the natural colouring of skin. However, there are times when overexposure to the sun results in the excessive production of melanin. This helps absorb UV rays and can result in the uneven pigmentation which appears as freckles and spots on the skin. Pigmentation, as with acne, can be resolved with the application of lime as well as including food with citric acid in the diet. Scars are common problems that occur with acne. Most often, acne scars can be hidden with makeup. However, camouflaging darker acne scars with makeup may be a challenging task. The best method of getting rid of acne scars is through the topical application of lime juice on the affected areas. This helps remove dead skin and promotes the growth of new skin which gives the skin a healthy look. Benefits of vitamin C for skin can be best seen in its role in wound healing. Scurvy is a disorder that occurs due to lack of vitamin C. This occurs when the levels of vitamin C decrease rapidly at the site of the wound. An inflammatory response often increases free radicals at the injury site. Although it is not clearly understood how vitamin C works in limiting free radical damage, it is clear that free radical damage is limited by the presence of vitamin C. It is believed the increased function of vitamin C at the site of the wound is a result of increased synthesis of dermal collagen. Furthermore, vitamin C may promote keratinocyte differentiation, which stimulates the build-up of the outer skin barrier. These qualities of vitamin C makes it an essential oral medication for those suffering from bed sores, burn wounds and other forms of dermal trauma sites. With all the benefits of vitamin C for skin such as healing wounds and curing damaged skin, you may want to know where and how can you get sufficient vitamin C? Guavas, kiwi fruits, papaya, oranges, pineapple, strawberries, raspberries, cranberries, blueberries, cantaloupe and watermelon are fruits high in vitamin C.
All types of green, leafy vegetables contain high amounts of vitamin C. Vegetables that include vitamin C are broccoli, cauliflower, Brussels sprouts, green and red peppers, cabbage, spinach, turnip greens, winter squash, leaks, kale, tomato and onions. The health benefits of vitamin C can be ensured by incorporating some of the above fruits and vegetables into the daily dietary intake. Oral prescriptions of vitamin C supplements will be given to those who require the wound healing qualities of vitamin C.
Healthy skin is also promoted by using cosmetics with vitamin C. Many reputed products claim to reverse the signs of aging and UV damage, treat acne and lighten the skin. Cosmetic products, such as Avalon Organic Botanicals vitamin C Moisture Plus Lotion with SPF15 and Vitamin C Anti-aging Face Serum by John Masters Organics contain vitamin C.